You can see a bit under the sheet metal. It is just the turret core model, no armor at all it will change hopefully to the clamshell we saw of the scale model. Russian turret models are the best protected shapes like T-90A, regardless how the turret moves the armor still protects most of the turret unlike western designs as soon as they move the turret to the side the armor protection is on paper level for every serious AT weapon. BKP wrote: Thanks for replies regarding bbc piece. And, yeah, the British press is a real pisser. Interesting. If RF needs to develop the capability to produce 22nm chips, then I would guess it's considered a priority to do so. I remember reading a piece in (I believe) an IEEE publication a couple of years ago about the supreme difficulty in detecting trapdoors and other malicious code in firmware, much more so than in OS or application software. So I would hope that Russia would never opt to use western-designed chips in critical systems. All of these are chip R&D facilities making various chips for various purposes, some of these are made domestically in Angstrom, and some are made in China/Taiwan with 1 (Modules ARM) is co-developed in Fujitsu Japan. Nanometer does not indicate instant reduction in power usage, as I should remind some of you, the Elbrus 2C+ operates within 40W, which is pretty darn good for a 90nm processor and operates significantly cooler and less power hungry than the AMD x86 processors running at 40nm and less. I've decided that I'm interested in this subject, so thanks for the links bruh. I'll be sure'n check them out. sheytanelkebir wrote: One issue with the microelectronics / imports highlighted is not for the basic ballistic computers and autoloaders etc (which the current generation of russian electronics will easily handle)... but for current / future augmented reality systems where you would need 22nm and better chips to reduce power consumption on visor and UAV mounted electronics. 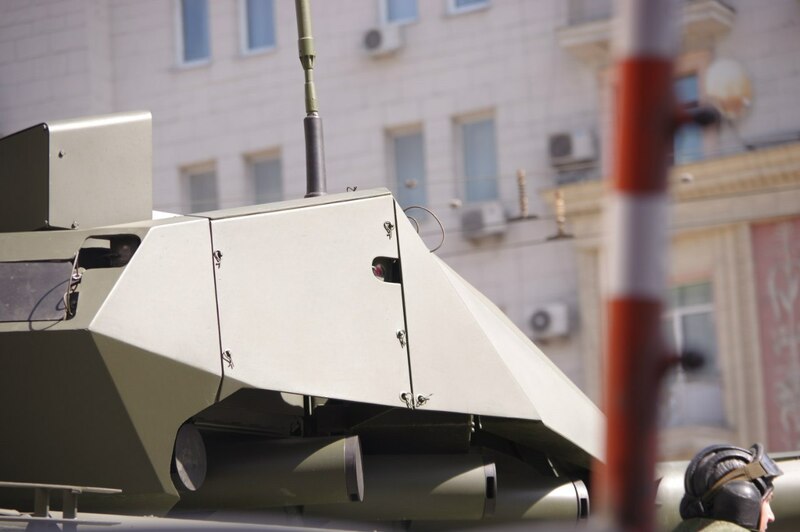 Also I would say that in the future Armata tanks and IFVs should each have 2-3 small UAVs which are charged on board and launch and fly automatically above / in front of the vehicle as a forward scout and give a better Situational awareness for the crews. Those would also benefit from the 22nm and better chips to reduce power consumption and improve the endurance of each UAV... Imagine that a "buttoned up" tank would be launching and recovering these small UAVs automatically, the commander simply having the feed from these cameras fed to him without having to think about launching or controlling an individual UAV. whilst one UAV is in the air, the other 2 are getting charged on the tank in their own "recharge stations" that they land into automatically when their power goes low. Such an addition would only cost maybe $100k per tank (with three thermal camera equipped UAVs). a small price for a dramatic improvement in SA. As was shown a few pages ago, there are a series of rear view cameras... so I imagine that the driver can drive the tank forward and backwards effortlessly without having to "think" about which direction he's driving in. when he engages reverse, his visor and controls automatically switch... perhaps he just has a little sign on his visor/screen with "R" on it. pattern recognition is gross overkill. I see these "VR" tools being more relevant for pilots and not tank operators. 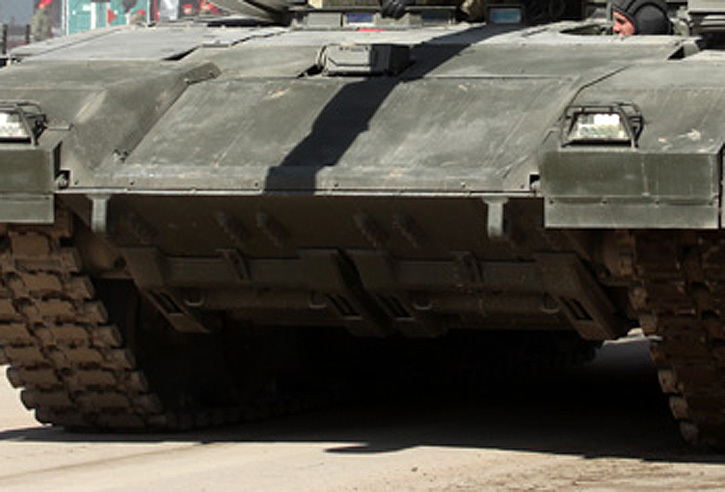 What a modern tank needs is high level sensors (spanning visible to IR emissions) and the ability to track the significant objects in its vicinity. Sophisticated detection technology coupled with training will run circles around some pattern recognition system that "augments"
Hmm. Now, I'm not disputing with you, because I just don't know enough about it to have a solid opinion yet, but, how do you know for sure that tankers wouldn't benefit from, say, a helmet-mounted VR display? Have you seen some studies indicating that? But, maybe that would all be superfluous, IDK. Actually, it would obviously be incredibly interesting to know what interface they did come up with, if it's something new or new-ish. But, looks like we won't know for quite some time. The UVZ chief said in an interview the other day that they intend to keep a lot under wraps for a good while (there was a link posted here). Werewolf wrote: It is just the turret core model, no armor at all it will change hopefully to the clamshell we saw of the scale model. Russian turret models are the best protected shapes like T-90A, regardless how the turret moves the armor still protects most of the turret unlike western designs as soon as they move the turret to the side the armor protection is on paper level for every serious AT weapon. The turret is unmanned, meaning it has vastly more places to mount armor, it can have thicker armor than a Leopard, yet the turret can weigh lighter and be smaller at the same time. And even if it does not have any armor on the turret, so what? The only things that are up there are the gun, targeting, and APS, what is there that you can actually protect? A hit to the gun/gun mantlet will disable it, even on the heaviest of tanks, and the aps systems are impossible to armor, and you can forget trying to armor the sights to any level. Everything is fine Werewolf, the turret needs no changing, rather everyone else must change to catch up. I don't think they're going back to smooth looking turrets going by what's been said so far. Reducing the radar/thermal sig seems to be one of the requirements for the tank. Regarding equipping the tank with UAV's, IMO that sort of thing is better left to a dedicated recon vehicle. The data can then be passed on to the tanks....I suppose having a mini helicopter type UAV could be feasible and useful in some situations. Austin wrote: Interview with deputy general director of corporation "Uralvagonzavod" Vyacheslav Halitov. And we offered today its unprecedented level, providing, in addition to the passive armor with ceramic plates, a kind of "protective dome", consisting of active protection and the protection of the upper hemisphere, systems setting screens and electromagnetic protection. tracking for a long time and Russian electronics are more than sufficient for the job. simple analysis, the opposite of trying to exclude the damage outside some perimeter is to absorb the damage in a volume. paradigm, making the turret smaller is actually detrimental. Some of the comments under the Ukro propaganda TV of the "paper Armata" was this. Does anyone have that photo from several days ago (back when t-14 had a tarp over the turret) where t-90 was passing right in front of t-14? So the image was two tanks almost perfectlyy side by side, with t-90 being in front and t-14 being visibly larger behind it? Victory parade over.. and no armata failed ,at least not in front of cameras..
at red square and they passed too fast to see anything really. and the Big Letters of Victory parade covering half the screen. .
any case we will not see Armata in service until 2018 ,so lot can change in the production models. Still was good to have a preview of them. WOndering if the final specifications of the tank will be released , interested to see more about armata tank and T-15 sensors and technology and how it works. Theres a reporter walking around the Armata and patting its armor. Vann7 wrote: Victory parade over.. and no armata failed ,at least not in front of cameras..
Not to encourage the nay sayers but you will notice that 3 T-14's and 2 Buk's were pulled and parked down the ramp just before the vehicles enter Red Square in the Parade video. The fact that these new AFV's go directly into testing after the parade will not matter to some. There is nothing you can armor on to the turret. You could if you wanted to however, you do not suffer the same volume sacrifices necessary for implementation of armor on manned turrets. But you are not seeing the big picture here, anything that could be armored, is no longer there. Many different pieces of military hardware were parket at Manezhnaya sqare, most likely as backups. They were there before the mechanized part of the parade passed by. Take a loot at https://www.youtube.com/watch?v=rrSzCnz9Sic at 54:15 timestamp. Very good post, we got to see really close-up views of the turret bits and bobs. Look @1:43. The soldiers are lined up and standing more or less at attention. Then, there's one dude to the immediate left of the gun holding... what, a gift bag? Lol, did he just buy some bath salts or something? before they go into service. Not to encourage nay sayers but your F-22 and F-35 have been failing even after going into production. The F-22 even had to be suspended it uses even AFTER final production several times because of faulty designed hardware and the F-35 too.. So is nothing new.. it happens.. technology always needs refining. Specially when is a prototype and in under testing..But im sure in the case of Russia they will fix any issues by the time the go in service in 2018. Nothing to worry about. when it comes to defending an unmanned turret. The Armata platform is configured with an active mine countermeasure system, designed to detect or trigger mines ahead of the tank. Believe that is what I said in my last sentence. No fight here amigo. Maybe the core internal turret is invulnerable.. but the thin metal sheet stealthy box in the outside ,is actually very weak ,bases on photos and close shots ,that shows the stealth hat ,is a thin steel sheet cover.so a single hit by any tank shell will completely wipe at very least all the optics and sensors and leave the turret on its bones. Losing all its APS capabilities. I hope they add more real armor to protect even the outher stealth cover of the turret and its sensors.. ideally make it completely solid and dense the whole stealth cover. and its sensors/optics will survive either 30mm gun fire or a simple grenade explosive ,tearing away stealth cover ,with the attached optics and sensors . Hopefully the final tank will have more real armor on the turret and make more solid the turret for protection of the sensors and optics and piece of mind.